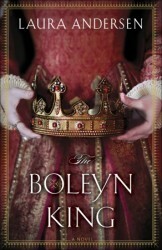 Perfect for fans of Philippa Gregory and Alison Weir, and Showtime’s The Tudors, The Boleyn King is the first book in an enthralling trilogy that dares to imagine: What if Anne Boleyn had actually given Henry VIII a son who grew up to be king? "Scrawled across the bottom in large, angry letters was nothing less than treason: England will not have a Boleyn King." (loc.861)An alternative historical fiction, The Boleyn Kings asks us What if Anne Boleyn had given birth to her son? William is this son, and he succeeds his father Henry VIII and becomes King. This book begins the account of his official reign, as well as the lives of his older sister Elizabeth, and their friends and confidants Dominic and Minuette. In a world of lies, wars, secrets, treason and romance, The Boleyn King is a diverse book that accustoms to many interests. I fell in love with the book more and more as I read on. Not only does it cater to my historical fulfillment, but my fantasy, adventure and even romance needs as well. This is saying something, since I wouldn't consider myself the greatest romance genre aficionado. The love, lust, hate and ignorance between the characters gave way to secrets and forlorn hopes within the kingdom, and it may be this very aspect that may lead to William's undoing. Who knows? I certainly wouldn't mind finding out from the next books in the series! I found the characters wholly formed and personable, as their personalities developed throughout the book as they grew in both years and experience. The strong-minded Elizabeth, quick-temper multitasking William, strategic clearheaded Dominic and cunning observant Minuette make a wonderful team as they try to ascertain peace in both their country and court. The scandal of murder and treason is a great drum that keeps the tempo of the novel as these four main characters try to determine who's spreading lies about William's parentage and claim to the throne. Princess Mary, who despises Elizabeth and William's mother, Anne Boleyn, seems to be at the center of things, but are things really as they seem? The author, Laura Anderson, has a glorified writing style, in which it is historically aged yet easy to read and comprehend. To me, the writing style and being able to easily understand it, is a huge factor in a successful historical fiction. In all, I found this book very delightful and fulfilling as I traipsed along with the characters while they do their best to protect and perform their duties to their nation, themselves and their King, William.